William Eckhardt Kohler reviews works by Margot Bergman at Anton Kern Gallery, New York, on view through August 26, 2016. 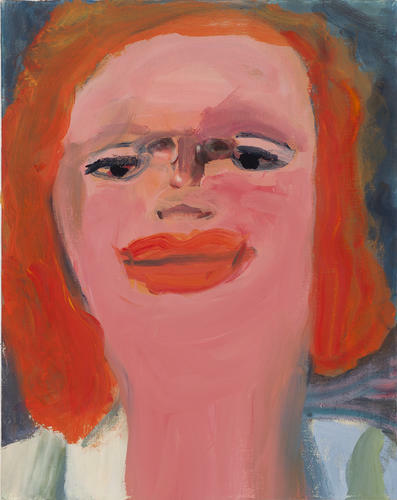 Kohler writes: "Comprised of sixteen imaginary portraits half of the paintings are part of her long practice of working on top of paintings she has found in flea markets... In the paintings on view here ... only a few fragments of eyes, nose and mouth peer out from the brow of each head, displacing the top painted eyes unnaturally far apart. The effect is alternately monstrous, humorous, jarring and psychologically charged while the faces Bergman channels are at turns pained, fragile, awkward, overly open and a little crazy. Beyond the notion of an imagined portrait, the split open skin speaks to a tear in a soul and gives rise to thoughts of masks and personae."